The Goodtime Six was not designed to replace the guitar, but rather complement it. It affords guitarists the chance to play what they already know with unimaginably creative results. The Goodtime Six is a 6 string, steel string banjo, that tunes like a guitar and features a fast, sleek, and comfortable guitar style neck that feels like an old friend. The Goodtime Six harnesses Deering's 41 years of banjo know how to put a much needed quality American made 6 string banjo within reach of any guitarist looking to add an authentic banjo sound to their arsenal without breaking the bank. 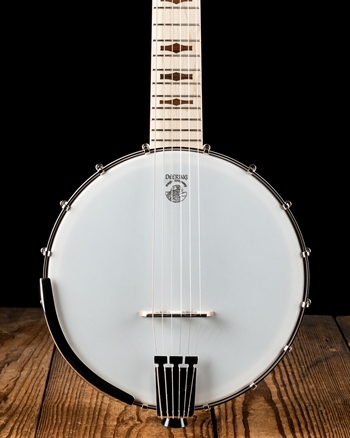 The Goodtime 6 features an 11 3-ply violin grade maple rim with a frosted top head for a traditional banjo snap. -Easy to play with clarity of note separation and round full bodied tone. -E,A,D,G,B,E In Standard Guitar Tuning Can easily be tuned in other tunings as well. -Scale Length Nut to Bridge 26 1/4"
-Overall Instrument Length 37 1/2"